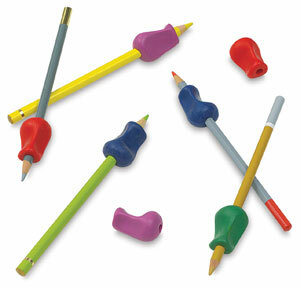 Designed by physicians to help stop writing fatigue, these colorful, soft rubber grips can also help small fingers hold pencils tight. They fit over pencils, pens, crayons, and many other drawing and writing tools, including some sizes of brushes. Assorted colors. Sold separately. 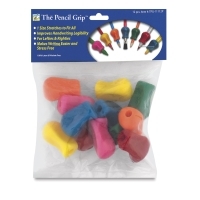 Pencil Grips, Set of 12 — Includes two each of Pink, Blue, Orange, Green, Red, and Yellow. ™ The Pencil Grip is a trademark.